A passionate plea from Superintendent Aaron Rosander, the unanimous support of its league peers and an assist from Riverbank was enough Thursday to convince a Sac-Joaquin Section realignment committee to keep Denair High School’s sports teams in the Southern League. The unanimous decision — while not final – is likely to have major influence on the Section’s Board of Governors, who will make the ultimate choice later this spring. It also marks a reversal from the committee’s recommendation last month to shift Denair from its longtime home in the Southern League to the much smaller Central California Athletic Alliance. Denair High Principal Kara Backman, Athletic Director Darrin Allen and school Trustee Ray Prock Jr. joined Rosander at the Section meeting Thursday in Stockton. Rosander read an emotional letter to the realignment committee retracing the perilous financial path the Denair Unified School District has been on the past five years. He told committee members that the district was nearly taken over by the state because its budget was so far out of balance. Its financial condition negatively affected enrollment, he said, especially at the high school level, which had a predictable domino effect on the competitiveness of almost all its sports teams. “It was a dark time,” he admitted. Fortunately, those days are well behind the district now. “The district has repositioned and rebranded itself within its region, and a budget that was once insolvent is now healthy, with assets, and growing,” Rosander said. “Enrollment that hit a low of 1,249 students a short time ago is now well over 1,300 and climbing. 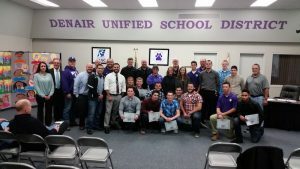 Denair High School’s sports teams have been a fixture in the Southern League for decades, but that athletic tradition would be lost and the Coyotes moved under a proposal being considered by the CIF Sac-Joaquin Section. The plan would shift Denair from the Southern League to the Central California Athletic Alliance, which also would include Big Valley Christian (Modesto), Brookside Christian (Stockton), Millennium (Tracy), Sierra Ridge (San Andreas), Stone Ridge Christian (Merced), Turlock Christian and Venture Academy (Stockton). Denair intends to fight the proposal, which would take effect in the 2018-19 school year. District Superintendent Aaron Rosander and Athletic Director Darrin Allen will attend the section realignment committee’s meeting Thursday in Stockton to formally oppose the plan. The section analysis suggests Denair should be moved because of its size and lack of competitiveness in the Southern League. The CCAA is a Division VII conference, made up of many of the smallest schools in the section. Denair High has about 275 students; the rest of the proposed CCAA ranges from 100 (Sierra Ridge) to 931 (Venture Academy). Division VII would include four other leagues in addition to the CCAA: the Central Valley California League, Mountain Valley League, Northern Pacific Athletic Conference and Sacramento Metropolitan Athletic League. The Southern League would remain a Division VI league. Its proposed members are Delhi, Gustine, Le Grand, Mariposa, Ripon Christian (except for basketball), Riverbank and Waterford. Only Riverbank is not currently a member. Orestimba, now in the SL, is proposed to be shifted to the larger Trans-Valley League. The proposed reorganization is part of a larger review of the 27 leagues across seven divisions from Merced to Sacramento overseen by the Sac-Joaquin Section. Justin Steeley, the heart and soul of a determined Denair High football team that succeeded despite limited numbers, was selected as the co-Most Valuable Player of the Southern League in voting by the league’s coaches. Also honored were Joe Brasil, chosen as lineman of the year for his play on offense and defense, as well as defensive back Brendan Curnow. Steeley is a senior who excelled at running back and linebacker. He scored 17 touchdowns and was the emotional leader all season for the Coyotes (6-5), who reached the Division VI playoffs before losing to eventual Sac-Joaquin Section champion Amador. For much of the season, Denair had no more than 15 players on its varsity roster. 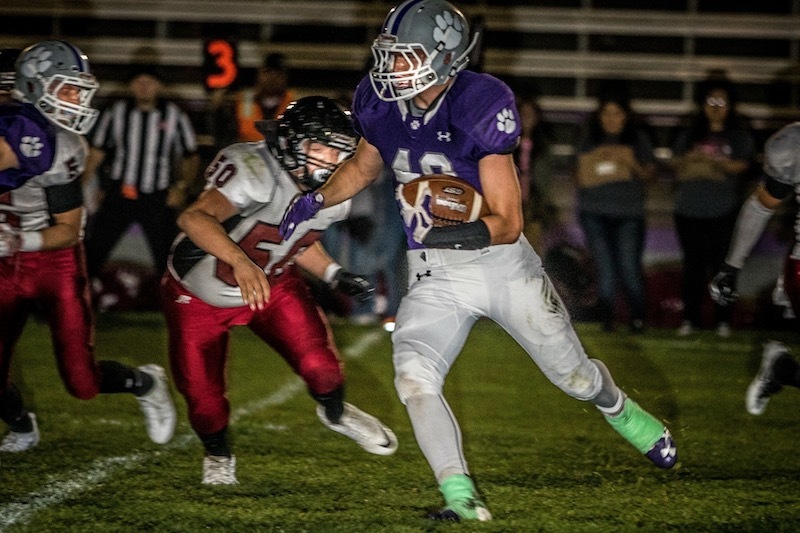 Steeley shared the league’s top honor with Toby Silva, a wide receiver and defensive lineman for league champion Orestimba. Brasil, a senior, was a force on both sides of the ball. At 5-foot-9 and 230 pounds, he was the Coyotes’ strongest player and the one they often ran behind on offense and counted on to make a big play on defense. Big plays were Curnow’s specialty. The senior scored six touchdowns as a running back against Le Grand and spearheaded the Coyotes’ ball-hawking secondary with hard hits and interceptions, including three against Ripon Christian. Three Denair players made the all-SL second team – defensive back Chase Pritt, linebacker Zach Ramalay and tight end Dylan Mann – while Joe Ciccarelli and Hector Obando gained honorable mention. The awards were announced Saturday night by head coach Anthony Armas at the Coyotes’ football banquet. 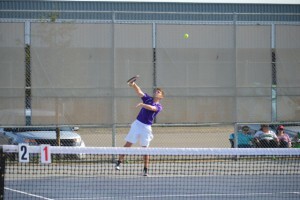 Denair’s Brian Dudley won the boys singles championship and was named the Southern League’s Most Valuable Player at the recent tennis tournament. Andrew Knapp and Abi Wilson brought the Coyotes a second title with their victory in mixed doubles. Dudley, a senior, defeated Jake Van Vuren of Ripon Christian 6-2, 6-1 at the Merced College courts to extend his unbeaten record to 18-0 this season. He will be the Southern League’s top seed when the Sac-Joaquin Section individual tournament begins Thursday at Oak Park in Stockton. Knapp, a senior, and Wilson, a sophomore, knocked off a team from Delhi to win their championship. The tournament was the first time this season the Denair duo had played mixed doubles this year. That came about after both suffered their first losses of the season in the semifinals of the singles tournament. Like Dudley, Knapp and Wilson advanced to the Section tournament later this week in Stockton. For the rest of the Coyotes, the season ended Monday with a 6-3 loss to Summerville in the first round of the Section team tournament. 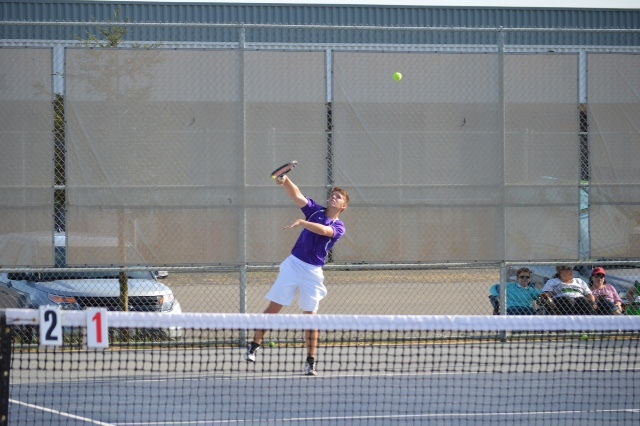 Dudley, Knapp and Wilson won their singles matches, but the Bears prevailed in all the other matches. Denair (12-3) finished second behind Ripon Christian in the SL this spring. 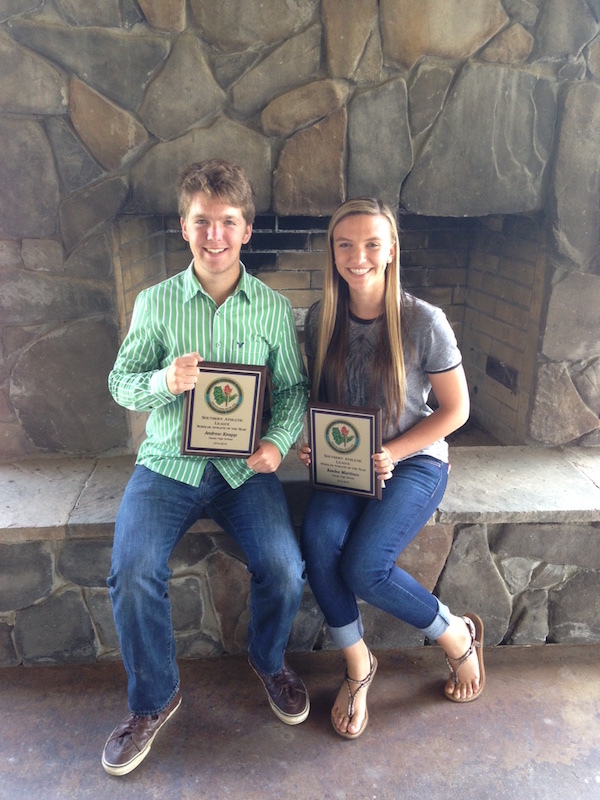 Two of Denair High School’s top students were honored this week by the Southern League for their academic and athletic accomplishments. Andrew Knapp and Kaelee Martinez have excelled in the classroom and as four-year members of the Coyotes’ sports teams, and have been actively involved with various school clubs and volunteering in the community. Knapp carries a 4.34 grade-point average, ranking him first in Denair’s 82-member senior class. He led the Academic Decathlon team to a third-place finish in the Stanislaus County competition earlier this year, scoring the most points in school history. He also has played varsity tennis and soccer all four years, is a member of the county Leadership Academy, the high school Drama Club, is president of Denair Matters, volunteers at the We Care Men’s Shelter in Turlock and plays guitar at his church. Knapp will major in biology and music at Fresno State University, and said his goal is to become a high school teacher. “Andrew is diligent in the classroom and in all of his extracurricular activities. He strives for excellence in everything he does,” praised Denair High Principal Aaron Delworth.